Sleeps 10 - ( queen bed sleeps 2, bunks sleep 4, kitchenette converts to sleep 2 and couch folds out to sleep 2) 1 Slide Out NEW: Tires (5), Roof paint and seal, A/C, Ceranmic Toilet, Full Size Queen Mattress, Bunk Pads, 20' Awning and outside detail) All 4 bunk beds fold up to give you lots of storage! Store the kids bikes or other camping gear. Included in price is anti-sway bars, weight distribution and trailer hitch mount. Also included is delivery up to 50 miles from Riverside, CA. Additional miles will be negotiated. Tags are up to date. Very clean & well-cared-for. Excellent condition physically and mechanically. Waxed annually. Covered in storage. Recently serviced engine and chassis. 6 new Michelin tires (nitrogen filled). 4-bike, hitch mounted rack. Stainless wheel covers. Stock #170569 Camping World and Good Sam Elite membership included! 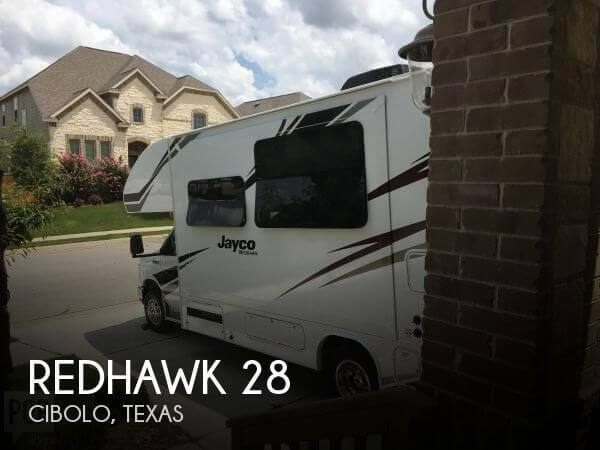 If you are in the market for a class c, look no further than this 2018 Redhawk 28, priced right at $81,200. This Class C is located in Cibolo, Texas. She is also equipped with a Ford engine that has 7,379 miles. 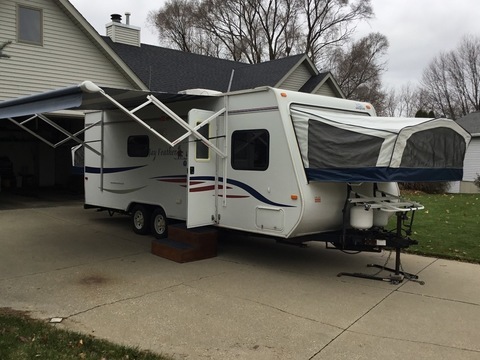 Reason for selling is wife wants travel trailer. Stock #174736 Start your Journey today and fly like an EAGLE in this Class C RV Today. If you are in the market for a class c, look no further than this 1992 Eagle 30, priced right at $17,750. 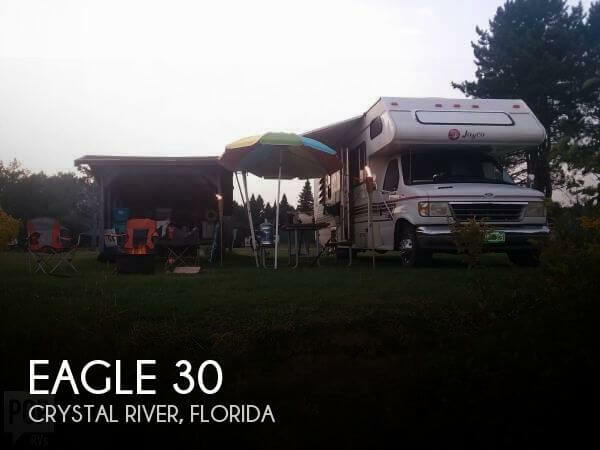 This Class C is located in Crystal River, Florida and is in need of some work. She is also equipped with a Ford engine that has 48,000 miles. Reason for selling is purchased a park model. This RV is in good condition for its age. Some non-structural damage to passenger side lower body and driver side rear. Per the Seller, all-new plumbing, flooring and roof in 2017, rebuilt transmission in 2018. New awning in 2018. Two brand-new front tires also included. Stock #172817 Welcome to a world of freedom! Vacations, weekend getaways, or even the "Van Life!" 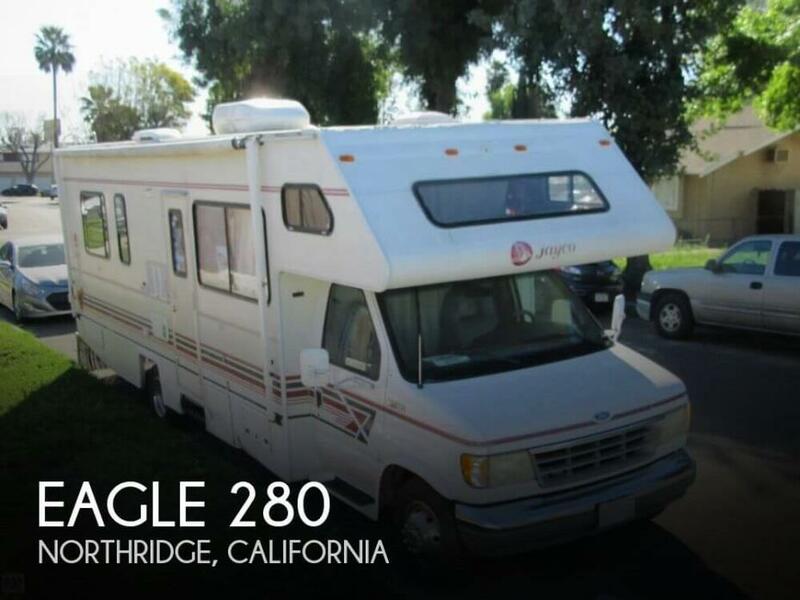 If you are in the market for a class c, look no further than this 1994 Eagle 280, priced right at $28,900. This Class C is located in Northridge, California and is in decent condition. She is also equipped with a Ford engine that has 62,700 miles. Reason for selling is moved into apartment and no longer uses.. The RV is exceptionally well maintained and in top condition based on a visual observation. Both inside and outside shows no signs of wear or negligent use. Likewise, its amenities are in excellent condition -- a clean RV. Stock #175136 Great shape, only on the road a couple times. 22,000. Rear kitchen with lots of space. Couch and dinette slide out. 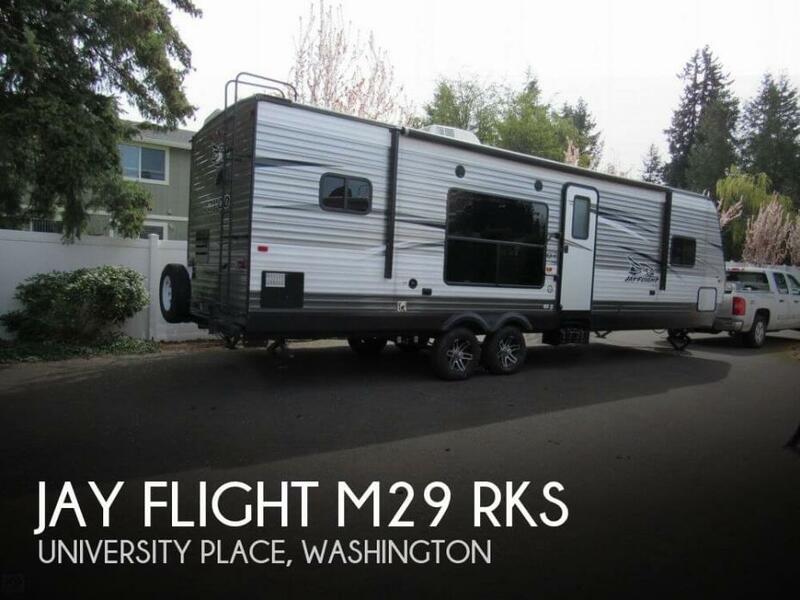 If you are in the market for a travel trailer, look no further than this 2017 Jay Flight M29 RKS, priced right at $24,750. This Travel Trailer is located in University Place, Washington and is in great condition. Reason for selling is do not use it enough. This well-maintained unit is nearly perfect and shows like new. Only used briefly, the current sellers have had some changes to their plans to travel extensively in the unit and are reluctantly choosing to sell at this time. It is a great opportunity to acquire a virtually new unit without the big new unit sticker price. Seller's favorite features are the smart floor plan, ample storage, and drivability. This unit is free of odors, stains, scratches, and flaws of any kind. The awning is new and the visors in the cab still have the original plastic on them. Save yourself thousands over the cost of a brand new unit! Don't miss this like new gem and schedule a showing today. Stock #167029 WHY BUY NEW? THIS ONE OWNER 29XK IS AS CLOSE TO NEW AS YOU WILL FIND! UNIT IS NEARLY PERFECT! 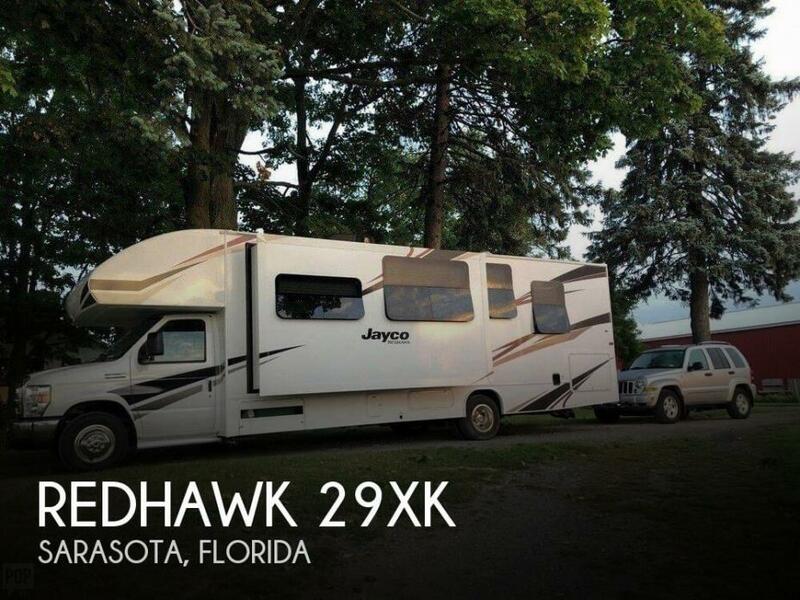 If you are in the market for a class c, look no further than this 2019 Redhawk 29XK, just reduced to $64,900. This Class C is located in Sarasota, Florida and is in great condition. She is also equipped with a Ford engine that has 4,700 miles. Reason for selling is changes in family plans. The RV is in superior condition. Everything works as it should. The exterior is always washed and debugged. The roof is spotless with no mold growth or aging sealant. The interior is just as remarkable as the exterior. There is a small quarter-sized hole in the passenger seat, located on top of the right shoulder area. All regular engine maintenance and RV winterizing is done by professionals and on schedule. Chassis battery replaced March 2019. Stock #169020 Low miles and very clean!! It's ready to take your family on an adventure! 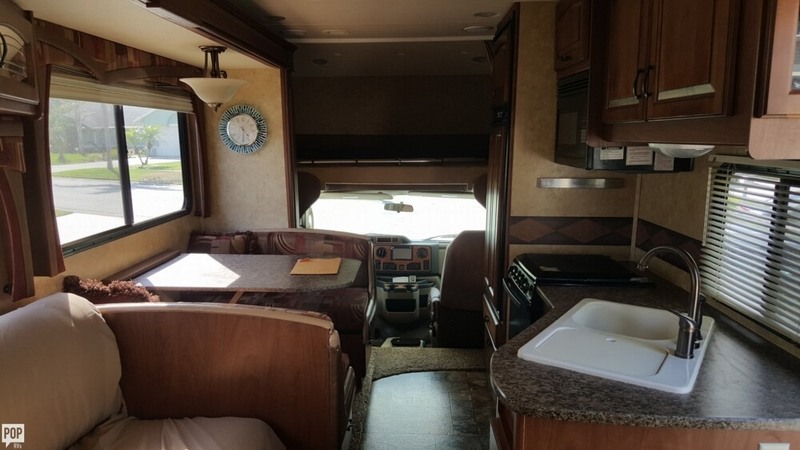 Reason for selling is moving into a larger rv. Since the trailer has always been stored in heated storage each winter, it is well cared for. There are not any odors or unreasonable wear or tear. The seller has taken very good care of this trailer. Seller states that everything works precisely as designed - all systems go! **4/9/19 - Seller reports small soft spot on the floor next to the sink. Has reduced price to reflect soft spot. 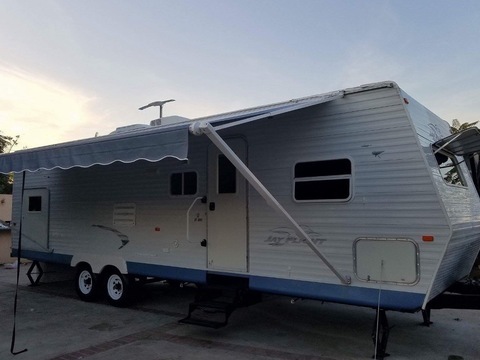 Stock #172785 ++ Extremely Clean Eagle (by Jayco) -- Plenty of Space -- Many Extras ++ If you are in the market for a travel trailer, look no further than this 2008 Eagle 328RLS, just reduced to $17,250. 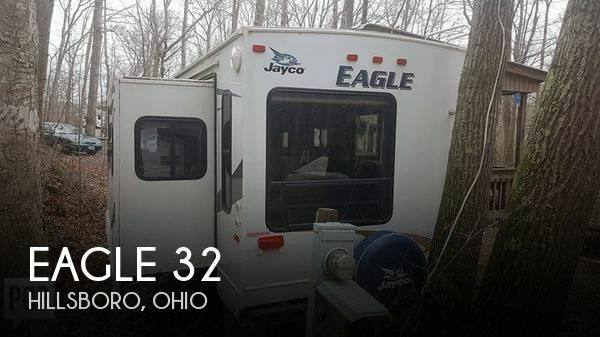 This Travel Trailer is located in Hillsboro, Ohio and is in great condition. Reason for selling is no time for use.. This is a great Class C coach! The seller has driven 52000 and enjoyed it! The coach has normal wear and tear for its age. The Ford engine and generator fired right up. 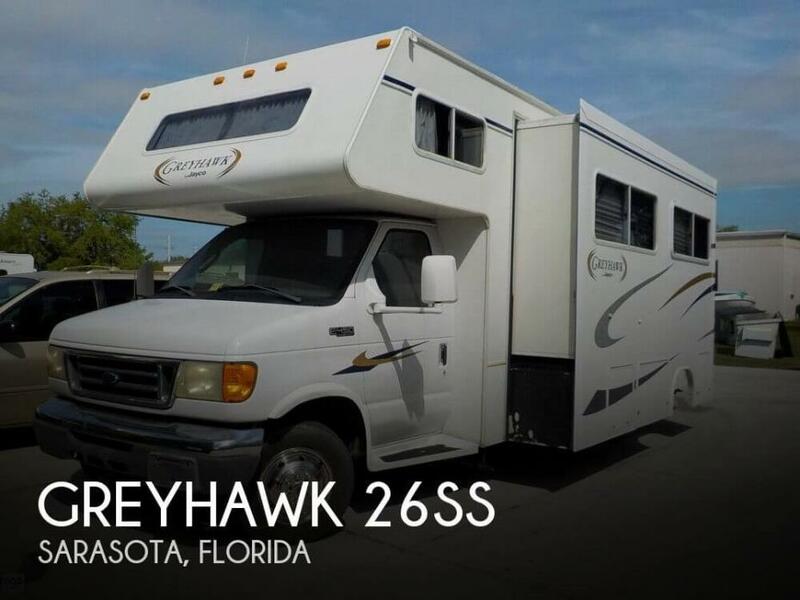 Per the seller, this Greyhawk is ready to roll! Stock #174749 Sleeps 6- Ready for it's next adventure- rear bathroom If you are in the market for a class c, look no further than this 2004 Greyhawk 26SS, priced right at $30,000. This Class C is located in Sarasota, Florida and is in good condition. She is also equipped with a Ford engine that has 51,939 miles. Reason for selling is not using enough. RV is in great shape for the year. Owner says everything works and functions correctly. Engine and generator sounded solid when running. Electric awning and slideout worked well. Leather on the sofa, drivers seat, and passenger seat is peeling. Will need to be repaired at some point. All else seems to have been well maintained. Stock #174032 Beautiful Class C RV! Very spacious and comfortable! Great condition for the year. If you are in the market for a class c, look no further than this 2011 Greyhawk 31, priced right at $56,700. This Class C is located in Titusville, Florida and is in great condition. She is also equipped with a Ford engine that has 39,000 miles (as of April 6). Reason for selling is downsizing. From the seller: Everything works as it should, no stains, no smoke, no pets. Looks great been kept under shed, not in the sun. The new tires were just installed in 2018. They are 10 ply 225/75/R15 Viatus Sotera. Stock #175446 Well maintained 328 RLTS with new tires! Fireplace & 40" LED TV in living area! Stand up shower & porcelain toilet! 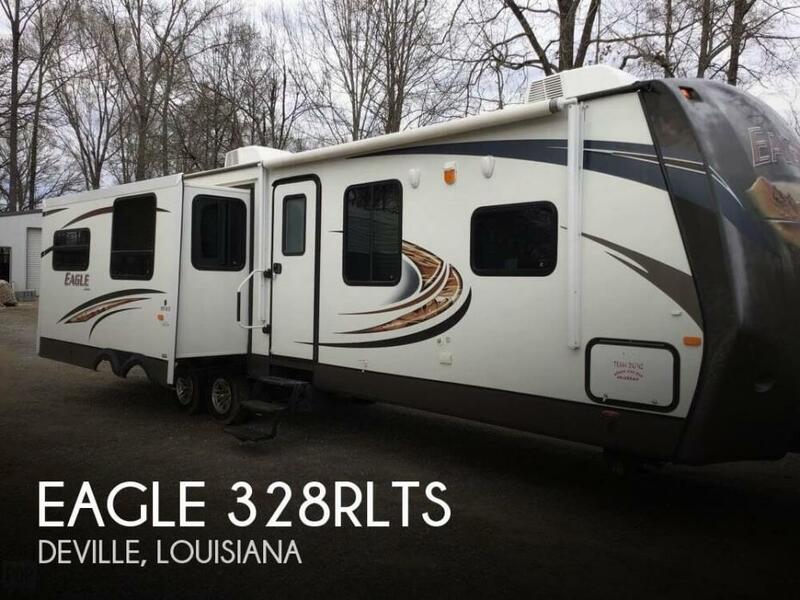 If you are in the market for a travel trailer, look no further than this 2013 Eagle 328RLTS, priced right at $22,650. This Travel Trailer is located in Deville, Louisiana and is in great condition. Reason for selling is ready for new adventures!!!. 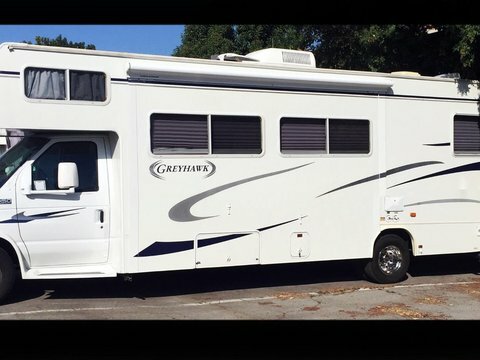 This RV broker has not personally inspected this 2017 Jay Flight 32 BHDS. 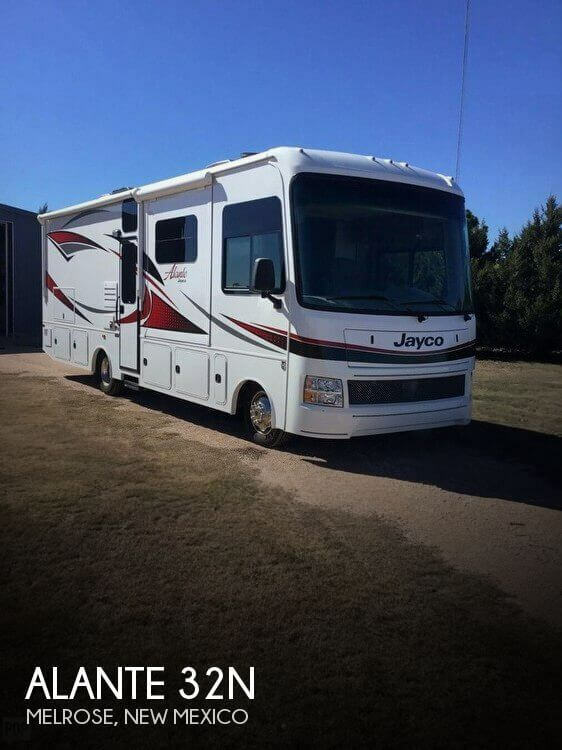 All photos and information have been provided by the RV Owner and Jayco industry information It is advised that a prospective buyer conduct a personal inspection to verify the accurate condition of the RV.__ Stock #171152 2017 Jay Flight 32 BHDS - Bunk Layout !!! LIKE BRAND NEW !! 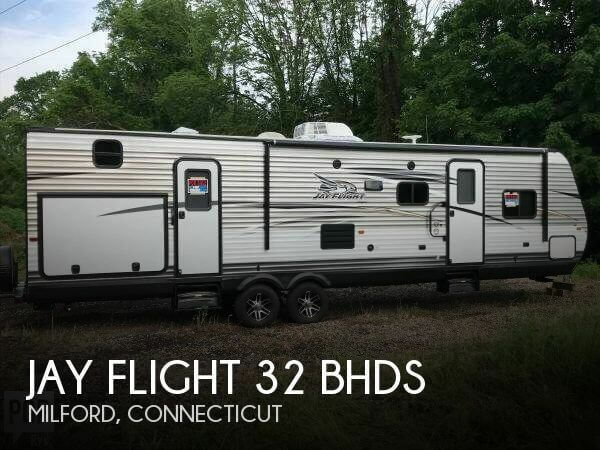 If you are in the market for a travel trailer, look no further than this 2017 Jay Flight 32 BHDS, priced right at $27,800. This Travel Trailer is located in Milford, Connecticut and is in great condition. Reason for selling is sold truck needed to haul the rv. 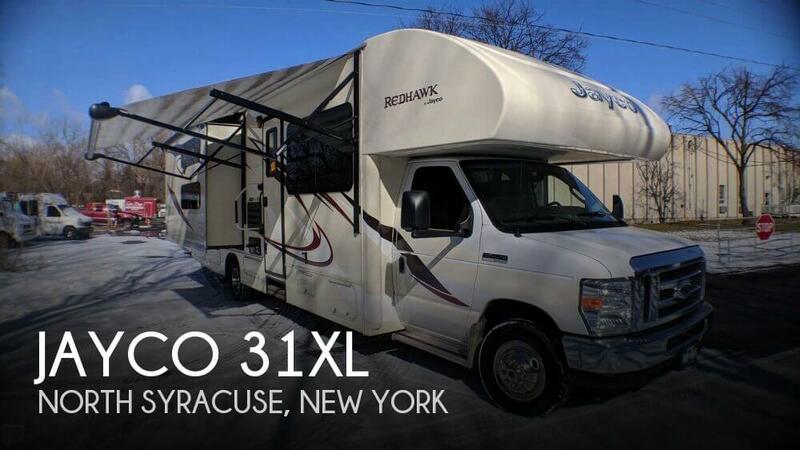 As per seller, this 32 foot RV is in excellent condition. All interior upholstery is in excellent condition. Kitchen and all appliances in perfect working order. Air conditioners, generator and engine are in excellent working condition. Stock #170830 2017 ALANTE 31P, VERY CLEAN CAMPING MACHINE!! VERY FEW MILES!! LOT'S OF STORAGE INSIDE AND OUT!! READY TO GO ON YOUR NEXT FAMILY CAMPING TRIP!! If you are in the market for a class a, look no further than this 2017 Alante 31P, just reduced to $85,000. This Class A is located in Melrose, New Mexico and is in great condition. She is also equipped with a Ford engine that has 5,300 miles. Reason for selling is not using anymore.